Nutmeg Soaring is actively seeking new members from our home state Connecticut and from New York and Massachusetts. 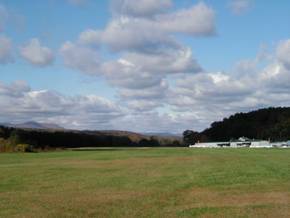 Our privately owned airport is located in Freehold, NY, some 20 minutes south of Albany, NY, near Hunter Mountain. Nutmeg Soaring Association is a not-for-profit organization dedicated to teaching and practicing the art and science of motorless flight. Q. How do you get the glider up in the air? 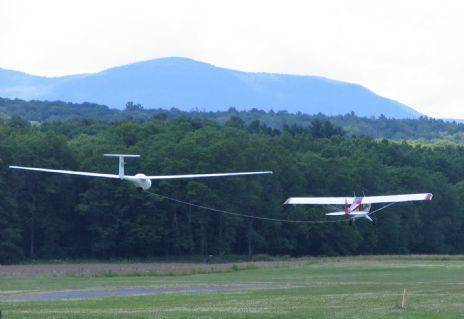 A tow-plane tows the glider up, using a 200-foot nylon rope. The glider pilot pays for each tow, $35 to 3000 feet above the ground. This price covers the price of operating the tow-plane -- tow pilots are volunteers (i.e., they are not paid). Q. How long does a glider flight last? Usually about 20 minutes, for instructional flights. If soaring conditions are good, flights can last for several hours (a 5-hour flight is one of the requirements for the silver badge of the Soaring Society of America). Q. What are "good soaring conditions?" Do you need a lot of wind? Wind is not the key ingredient -- what a glider pilot needs is rising air. If he finds rising air, then he does what he can to stay in it. On most days, air rises as a result of the sun heating the ground, and therefore the air at ground level. The heated air rises, until it is in air with the same density. So we need sunny days, with unstable air. Usually the heated air rises high enough for the moisture to condense and form a cloud, the 'heap' cloud (cumulus cloud) of good-weather summer days. Cumulus clouds like the ones shown below promise a lot of "lift" and long glider flights. Q. What's involved in learning to fly a glider? You fly with an instructor in a 2-seater, dual-control glider; you're in the front seat, the instructor is in the back seat, and you each have a set of controls. Flying a glider (or other aircraft) straight and level is pretty easy, it really flies itself. More difficult are turns, flying on tow behind the towplane, takeoffs and landings. The FAA requires you to have 30 flights before you can take the exam to get a pilot's license. Teenagers learn very quickly (you can get a glider license at age 14); adults learn somewhat slower. There is no charge for the 'use' of an instructor or a club glider; you pay for the tow. Above: on tow. As you fly the glider, you control your vertical position to "hold the wings of the tow-plane on the horizon" (not above, not below). You control your horizontal position to be along the axis of the towplane -- or just to the left, as in the photo. The "yaw string," taped to the outside of the canopy, indicates whether you have the glider fuselage going straight through the air, or are going a wee bit sideways; you want the yaw string to be pointing straight back. As to the instruments: Top left is the airspeed indicator, showing we are being towed at about 75 knots (nautical miles per hour). Top right -- the vario, or vertical speed indicator, shows that we are climbing at about 550 feet per minute. Left bottom -- the altimeter shows that we are at an altitude of 3560 feet above mean sea level. 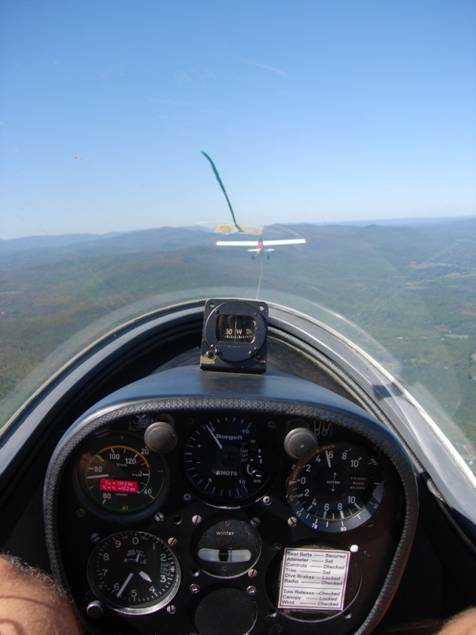 In the photo above, the person in the front seat of this two-seater glider has taken the photo, while the person in the back seat flies the glider. Staying in position on tow takes the pilot's full attention, so it would be difficult for the same person to fly the glider and take the photo at the same time. A Typical Day With Nutmeg Soaring: Operations start about 9 a.m. with everyone pitching in to pre-flight and stage the gliders. During the morning and early afternoons, student pilots will be flying with instructors. Throughout the day soloed student pilots are flying club ships after discussing their flight plans with an instructor. Gliders are regularly taking off behind the tow planes and landing, with everyone helping retrieve and stage them for the next flight. On good soaring days, pilots who own their own gliders are typically off on a cross-country flight many miles from the airport. Evenings: Many members make use of the pleasant camping area at the airport, the club bunkhouse, or find a local motel or B&B. The Catskills lie 3 miles to the south. Their ~3600-foot peaks provide slope, or “ridge” soaring and are good triggers for kicking off thermals. With stronger winds, mountain waves can cause ripples in the atmosphere capable of being ridden to very high altitudes. Alternate landout sites are plentiful in the regions to the northeast and northwest of the airport. Catskill Creek forms the airport’s southern boundary, and is stocked with trout. The Catskill region has many other attractions for family members, or for non-flying days. Gliders: Two-place: 2 Blanik L-23 (Superblanik) trainers; one high performance Grob 103 ‘Twin II.’’ Single-place: one Schweizer 1-26 and one higher-performance Blanik L-33 “Solo”. Tow planes: a 230-hp Husky, and a 235-hp Piper Pawnee. Runway: 2275x22 feet blacktop, with 600 feet of turf at each end. Season: April through November. Operating Days: weekends and holidays; weekdays by arrangement. 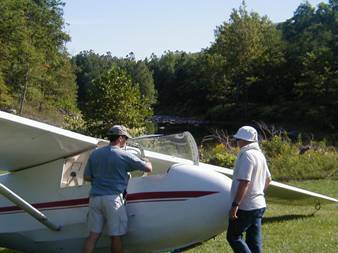 Instruction – Free to Members : Our instructors are all FAA Certified Flight Instructors - Gliders. Each has hundreds, and some, thousands of hours of glider experience. Many are commercial airline pilots and most own their own gliders. Collectively they have a lot of cross-country and contest experience, offering both student and rated glider pilots a wealth of practical guidance to help foster continued growth in the sport. Nutmeg instructors together typically provide 400-500 instructional flights per year. Safety: Safety is the number one training and operational priority for Nutmeg, and demands a personal commitment and involvement by all members. Safety is no accident, and we take it seriously! Social Aspects of a Glider Club: Nutmeg Soaring is not a commercial glider operation and does not sell glider rides. Consequently, club operations depend on mutual help – for launching, retrieving, towing, supervising operations, maintenance of aircraft and airport facilities, etc. Most Nutmeg members value the resulting camaraderie just as highly as the flying activities. This club is well suited to people who have initiative and like to be active and helpful. We have a youth scholarship program for selected high school students each year. Freehold Airport’s office provides a friendly place to hang out, with picnic tables and a large covered porch. A Nutmeg tradition is the noon hot-dog, cooked on the Nutmeg gas grill. How long is a soaring flight? Training flights are typically 15-45 minutes. Solo flights in club gliders average an hour, and experienced pilots in privately owned gliders fly for many hours on a good soaring day. How do you stay up? You look for rising air (lift). Most commonly, it’s in the form of thermals, bubbles of hot air that rise from ground heated by the sun; they condense at altitude to form the common fair-weather summer clouds called cumulus. Other sources of rising air are wind blowing up a mountain slope, or vertical waves downwind from a mountain. What happens if you don’t find lift? You come down in a gradual glide, like a paper glider. Safe and prudent glider pilots plan their flights and landings. For Costs and Fees, please see the “Costs” section elsewhere on this website. From the Taconic Parkway: take exit for Rip van Winkle Bridge; west on 82 (which changes to 23), and cross the Hudson R. Follow 23 ten miles, right on Rt. 32 for five miles to Freehold, left at the center intersection of Freehold onto County Rt. 67 for 0.8 miles. From the New York State Thruway (I87): Take exit 21 (Catskill); take Rt. 23 west for 10 miles, turn right ( North ) on 32 for 5 miles to Freehold, turn left onto County Route 67 for 0.8 miles.